A simple plastic bag seems harmless, but it can represent extreme suffering -- and even death -- for thousands of animals in the oceans, according to a campaign from Sea Shepherd. The disturbing imagery shows different marine animals such as seals and turtles in extreme agony after coming in contact with plastics from items used in our daily lives and generally discarded without any special care. The caption is "The plastic you use once tortures the oceans forever." Sea Shepherd is a nonprofit focused on the conservation of marine wildlife. The global campaign was developed in partnership with Tribal Worldwide Brazil and DDB Guatemala. The 3D production was developed by Notan Studio. A small and thoughtless action in our daily life can cause huge damage to nature without us even realizing it, says Guiga Giacomo, executive creative director at Tribal Worldwide São Paulo. “In this campaign, we aim to remedy this by reaching the largest number of people possible, bringing awareness to the fact that with small and easy steps, we can ensure that terrible scenes like these do not happen,” Giacomo states. 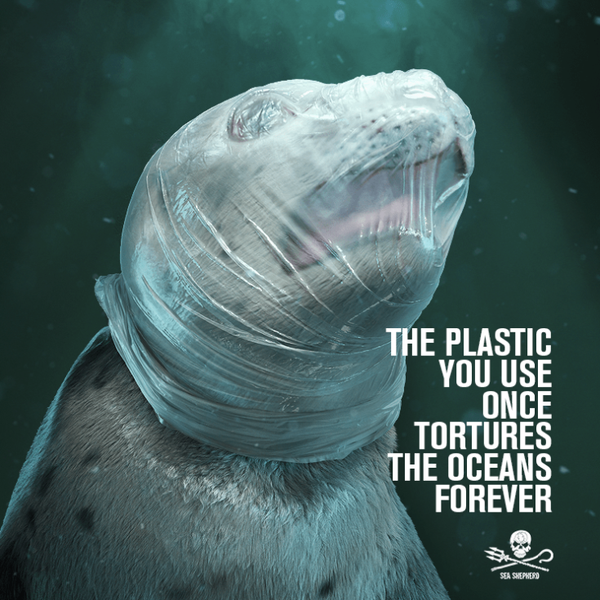 In addition to print and posters, social media and digital media pieces have been developed, and further information about the negative impact of plastics in the oceans is available at www.seashepherd.org. The online content also highlights tips to reduce the use of plastic on a daily basis. Sea Shepherd carries out beach clean-ups worldwide. The U.S. branch of the organization has a campaign entitled "Operation Clean Waves,” which collects marine debris that accumulates on offshore islands and in the middle of the ocean. Sea Shepherd also works with scientists to study the effects of microplastics on marine species. "Scientists warn that in 2050 there will be more plastic in the oceans than fish in the sea," states Sea Shepherd founder and president Captain Paul Watson, concluding, “Sea Shepherd is committed to preventing this from happening — because if the oceans die, we die."